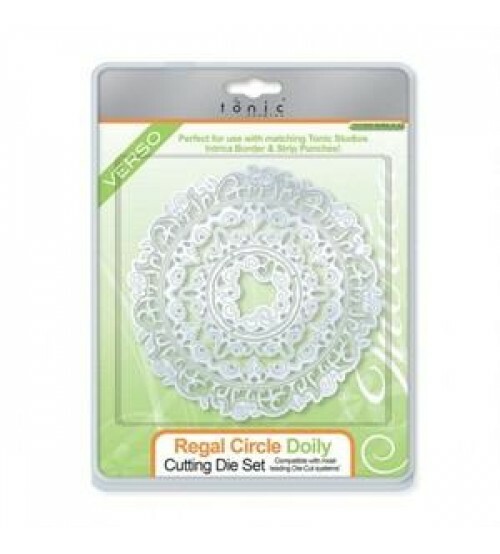 Tonic Studios Regal Circle Doily is a Seven die set, the Intrica Dies are the most intircate dies from Tonic Studios to date. All the dies are verso styled meaning that the achievable results from one dies set vastly increased, these results increase when used in conjunction with the border and strip punches. Intrica Regal Circle Die creates a beautiful and intricate pattern, this die works perfectly with the Intrica Regal Border and Strip Punches. Largest die is approximately 5.5" x 5.5".